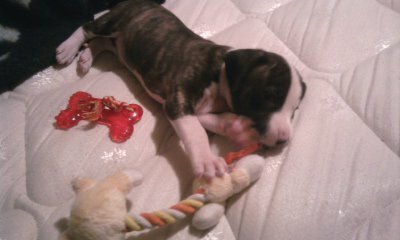 when he was just a baby ! 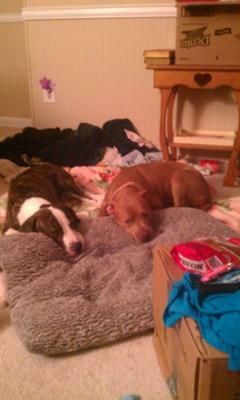 aww.. dont mind the mess, we had just moved in. SWAGGER - he is a pit mix, my bf and i got him from a friend when he was just teeny tiny and now hes a big boy! He will be 1 next month. One of the funniest things he's done - he was in the back of my bf's truck, we went inside the house for not even 5 minutes and when we came out he was on the roof of the truck! He loves to get himself in big trouble but i love him. He has separation anxiety so he has a hard time when we leave without him even for just a few minutes! He's very hyper, loves everyone he meets, other dogs and treats. 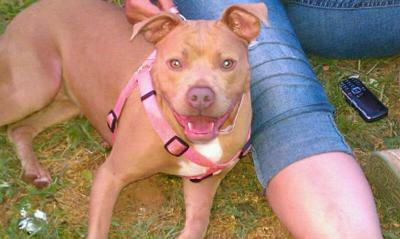 PENNIE - she is full pit.. we adopted her. The shelter said she's 2 but we believe she may be younger. When we first brought her home she had a very hard time adjusting to Swagger but now they are best friends. She was very very scared of me and my boyfriend. She would stay under the table and would NOT go outside after dark.. but now 4 months later we have finally gained her trust. She's much more comfortable. She goes potty after dark, she loves to cuddle, she doesn't hide under the table anymore, she's not scared to do what she wants. They are a cute pair. I love it!! I love to hear great and happy ending about pitbull families. It's nice to hear how much you love your babies. 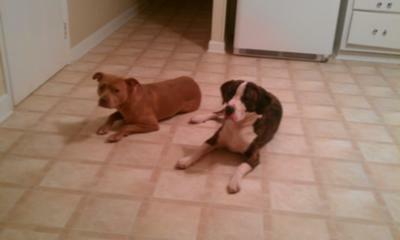 Great job with these two awesome dogs!!!!!!!!!!! Thank you so much ! I wouldn't know what to do without them two.